At present, this phylogenetic species of Morchella is insufficiently documented to characterize and name. It appeared in February of 2003, in my buddy Darvin DeShazer's back yard, in northern California. 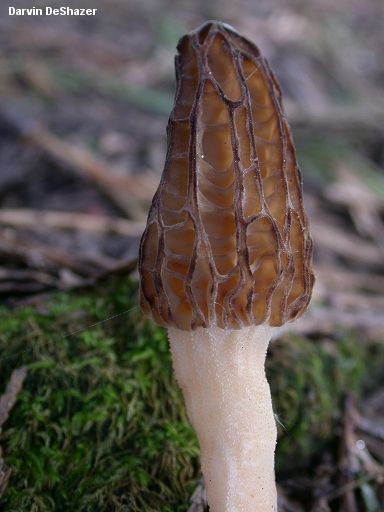 Darvin took some great photos, and sent in a collection to the now closed Morel Data Collection Project. DNA testing of his collection (O'Donnell and collaborators, 2011) revealed a separate phylogenetic species--but since only one well documented collection of the species exists, I did not include it in my treatment of morels in North America (Kuo and collaborators, 2012). 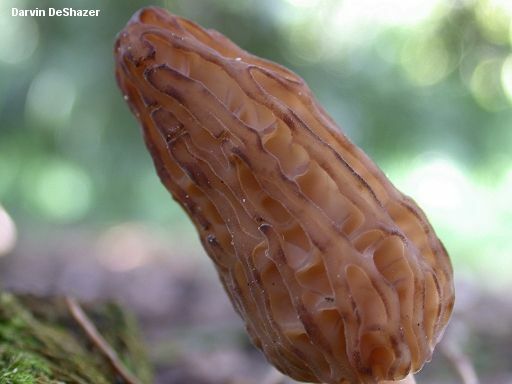 Morel species "mel-8" is a black morel, which means it has ridges that darken with maturity, pits and ridges that are primarily vertically oriented, and a cap that is attached to the stem with a small but noticeable groove. The species is virtually indistinguishable from many other black morels on the basis of physical features alone. 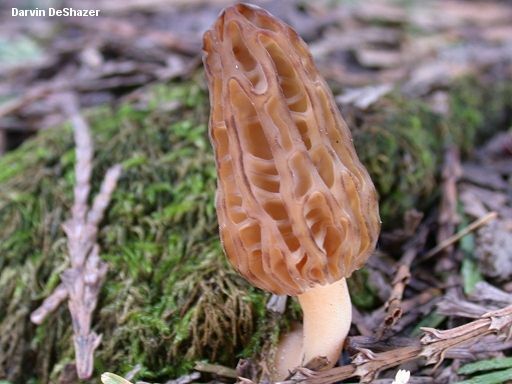 When distribution and ecology are factored in, however, the fact that Darvin's morel is western and did not appear in a burned conifer forest helps to eliminate most contenders, leaving only Morchella brunnea as a potentially confusing look-alike. The latter species appears to have wider, darker, more velvety ridges--but whether or not this distinction would be upheld when many collections of both species were examined is unclear; such variation in ridges is seen, for example, within one phylogenetic species in the case of Morchella angusticeps. Hopefully, additional, DNA-verified collections of both species will be studied by others in the future, perhaps leading to a reliable means of separating the two species. Ecology: Possibly saprobic and mycorrhizal at different points in its life cycle; growing under incense cedar in an old apple orchard, in an urban setting; February; northern California. Cap: 4.5 cm tall and 3 cm wide; conical with a bluntly rounded apex; pitted and ridged, with the pits primarily arranged vertically; when young with bald, bluntly flattened, pale brown to grayish ridges and brownish pits; when mature with somewhat sharpened, dark brown to black ridges and pale tan pits; attached to the stem with a small groove (a few mm deep); hollow. Stem: 4 cm high and 2 cm wide; equal; finely mealy with whitish granules; whitish; hollow. Microscopic Features: Mature spores not present. Paraphyses cylindric with rounded or subclavate apices; septate; hyaline in KOH. Elements on sterile ridges 75-100 x 7.5-15 µ; septate; brownish in KOH; terminal cell cylindric, subclavate,or subfusiform. REFERENCES: O'Donnell et al., 2011; Kuo et al., 2012. SPECIMENS EXAMINED: Herb. F. 02200306. Kuo, M. (2012, November). Morchella mel-8. Retrieved from the MushroomExpert.Com Web site: http://www.mushroomexpert.com/morchella_mel-8.html.